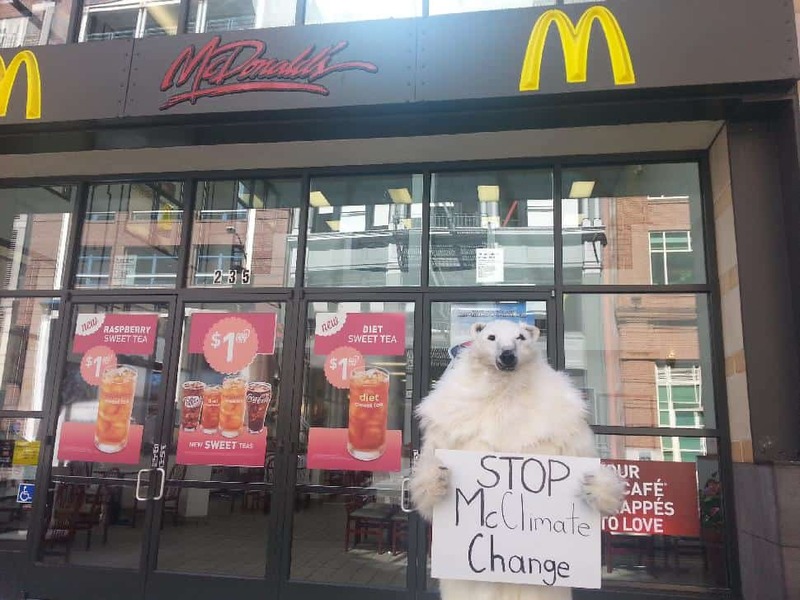 In the wake of McDonald’s announcement that it plans to start purchasing “sustainable beef”, the Center for Biological Diversity conservation organization has released an open letter from its polar bear personality, Frostpaw, to Ronald McDonald urging the fast-food giant to make its menu more sustainable by adding meat-free meals. The letter from Frostpaw is part of the Center’s new campaign that is urging Americans to “take extinction off your plate” by eating less meat in order to curb climate change, preserve ecosystems, and save wildlife like wolves and polar bears. The Center has also launched an online consumer petition for McDonald’s to expand into meat-free menu options to reduce its carbon footprint. Recently, Ikea announced plans to introduce a vegetarian version of its popular Swedish meatballs to reduce the carbon footprint of its menu. Consumers can join the campaign asking McDonald’s for meat-free meals by signing the Center’s petition. Additional information about the impact of meat consumption on the environment and wildlife can be found at www.TakeExtinctionOffYourPlate.com. In case you haven’t seen the news, experts around the world are pointing to humans’ meat-eating habits as a major factor in the crisis of climate change. Depending which researchers you ask, meat production accounts for as much as 51 per cent of global greenhouse gas emissions. For every burger you serve, there’s a little less sea ice in the Arctic, making it a little harder every day for me to find any happy meals. You’ve done well for yourself. McDonald’s serves 70 million people every day — that’s like 3,000 times as many people as there are polar bears left on the entire planet. But did you mean for your carbon footprint to be clown-shoe-sized? I mean, you don’t have a single meatless meal on your menu. Not one McBean Burger or McTofu Wrap. Meanwhile, more and more people are calling for humans to reduce meat consumption and eat a more planet-friendly diet if we’re going to have any hope of fighting climate change. Look, I know clowns may not be as popular as they used to be, and that’s tough. But you just got a complete makeover, a second chance to be a hero and an icon to millions of kids. For polar bears, there is no makeover — scientists say more than two-thirds of us could be extinct by 2050. So I’m asking you to use your second chance to give us our final chance. Fifty years from now, you could be telling kids at your restaurants that you knew a polar bear once, but we don’t exist anymore. That would be tragic. But you can still help stop that from happening. You have a lot of influence, and if you added meat-free options to your menu — not just salads, but hearty plant-based options that even carnivores like me could love — you’d show the world that you care about the planet, that you want children to love the natural world they were born into and have a healthy and livable future. And that you want wildlife like me to have a future at all. You and me, we have a lot to measure up to, living in the public eye like we do. We’re both symbols of something bigger than ourselves. I stand out here — at rallies, in front of the White House and now at your doorstep (or, rather, your drive-thru) — on behalf of my kind and the thousands of other animal species, including humans, who face serious consequences from climate change. What about you, Ronald? What kind of symbol do you want to be? What kind of movement will you lead?